The first reported traffic accident in the United States occurred in Ohio in 1895 when there were but two cars in the entire state, they met and one driver was killed. With the myriad of driver safety programs deluging our society today, why are traffic accidents still maiming and killing hundreds of Americans on a daily basis? As an expert since 1984 in the field of driver training (over 10,000 clients personally trained), I have discovered and created a brand new defensive driver training methodology that when understood and applied properly, can greatly reduce accidents and save lives. Many years ago, I began to invite parents to ride along in the backseat while I taught their new driver the Cullington Driving Concepts TM. The results were amazing. Virtually every parent commented they would have taught their new driver the exact opposite of the way I was teaching and to my surprise, these parents began looking forward to practicing with their new drivers. I noticed a drastic improvement in the amount and quality of parental driving practice received by the new driver in-between my scheduled driving lessons, a pattern I’d never seen before. This 5 Star Driver Training Video Course was specifically designed to empower parents with advanced driver training strategies, helping to prevent their children from becoming a traffic accident statistic. Driving is the #1 killer of teenagers and has been for over 70 years so how can anyone claim that the current driver education and State driver’s licensing industry is a competent industry? It isn’t. The truth is, the current driver education industry is broken and young drivers are most at risk. The current driver education and training providers primarily focus on teaching rules, regulations, and proper behaviors. These are all important aspects of driving but by no means do they complete the training process. What is missing? A viable driver training methodology that really works along with advanced defensive driving strategies. Let’s form an analogy with the game of Chess. If a person learns all of the rules and regulations associated with the game of Chess, does that mean they’re automatically going to be proficient? Certainly not. Knowing the rules of Chess and knowing how to strategically play the game are quite different. Knowing the strategies of Chess is a vital component of playing the game proficiently. The same occurs with learning how to drive. Driving rules and regulations along with driving behaviors are both vital components of driving. What’s missing is the understanding and application of advanced defensive driving strategies both from the Parent Driving Instructor as well as the student. This 5 Star Driver program provides both the parent and the new driver with a brand new defensive driver training methodology designed specifically to prevent accidents and is the missing link needed to create a strategically knowledgeable driver. The #1 Safety Feature you can put in a car is a driver that fully understands and applies the advanced defensive driving strategies found in the Cullington Driving Concepts ®. Taking the necessary time and effort to fully understand the information presented in this course will help to reap a lifetime of safe driving strategies for both you and your new driver. I had an interesting conversation with a 19 year old driving student recently. While I was looking at his permit he said that he was confused and then angry by what was said when the DMV personnel handed him his permit a few days earlier. The man asked my student if he was going to now take his drive test. He responded: “how can I do that I just received my permit to drive?” The answer was “well a lot of people do.” My student said “but how would a person know how to drive yet?” The DMV representative explained that people drive illegally with family members and then take their written test and try and pass the drive test the same day. To my 19 yr. old young drivers credit he told him “that is stupid and only because you folks allow it.” I agree, so true and so wrong in many ways. This absurd practice for licensing young adult drivers would explain the rise in death by a few years due to driving. The Graduated Licensing Program instituted years ago by the Department of Transportation does not apply to anyone above 18 years old. Passing the permit test and then having to wait 6 months before taking the drive test does not apply. Having a minimum of 6 hours of behind the wheel training with a driving school does not apply. Putting in an additional 50 hours of driving practice with a licensed 25 years of age or older teacher does not apply. Then the 18, 19, 20, year old takes the Dumber Than a 5th Grader 10 minute drive test to be licensed to drive. This ignorant driver is now licensed to cut me off in traffic, tailgate me up to a red light, not yield to me while entering a roundabout and dent my car as they park next to me at the shopping mall or much much worse. So much of what is wrong with the way things have become is due to the governmental agencies tasked with making things smart and safe doing just the opposite. Our motivation in producing the high quality 5 Star Driver videos is to push past the cheap driving schools and the D.M.V.,” Department of Mental Vacancy” to put parents in charge of their children’s driver training. Take the time with your kid’s over a sixth month training period, watch the videos together from start to finish. The accelerated learning curve is remarkable! People can listen to the video testimonials on our www.5stardriver.com website of 5 Star Driver users, parents and their kids, to hear real driving success stories. The ultimate goal being to have young adults break through the grim statistics when it comes to their early years of driving. So important at a time when driving has become a greater challenge than ever before. This is the look of stress brought on by parents who often have no idea on how to do real behind the wheel training with their kids. Click on this short video to see what took place between this dad and daughter. Knowing how to drive and teaching it are two completely different things. The person tasked with teaching a loved one or friend to drive whether it be a parent or grandparent or college roommate has a lot to risk in this endeavor. Their own safety, the safety of the new driver and often times it is their vehicle that is open to damage if things go badly. As a licensed driving instructor I once had a teenager who by the time I was hired to do his behind the wheel training had crashed through his garage door after taking a little drive through their neighborhood with his mom. He then panicked after hitting the garage door and mashed the gas pedal and proceeded to go through the back wall into their kitchen. Nobody drove with the young man for a year. After a year his Uncle said he could get him driving and took a try at it. He crashed into a fire hydrant while making a turn two blocks from their house. Then they decided to hire a professional. Lucky for them they hired an instructor trained in the Cullington Driving Concepts®, which is a new superior way to avoid the pitfalls where parents point out the problem instead of the answer. Look at this cartoon video that is spot on with what has been wrong with our behind the wheel training since the beginning. When teaching someone to drive, mentioning where you don’t want them to take the car is the biggest mistake. By saying, “You’re heading towards the only other car in the parking lot” you focus the driver’s eyes and or attention on that object and many times this is how the unhappy episode begins. 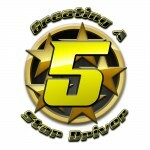 Our www.5StarDriver.com program has eleven hours of video showing all types of driving situations with new drivers using effective dialogue and instructions that guarantees accelerated success. This results in less frustration and stress between the behind the wheel student and teacher. Here is a clip of proper dialogue that works. The Creating A 5 Star Driver Beyond Drivers Ed® program is the most effective video driver training available for parents and their new drivers. It was developed to get parents much more involved in the important task of behind the wheel training with their kid’s. The experts @ 5 Star Driver were tired of the never ending statistics of young drivers passing a 10 minute drive test and soon becoming a driving statistic. Parents have put too much faith in cheap driving schools that don’t teach much. Parents also have good intentions on getting in the needed practice time with their children but most often do not. They hope that their kids will be ok out there. At the end they think, well they passed the drive test they must be ready. 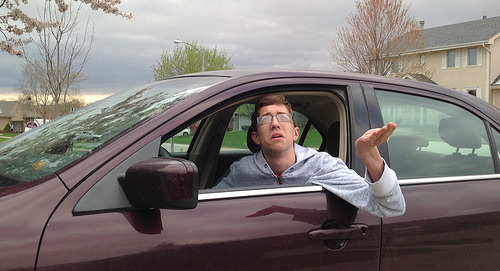 Parents must know that the DMV drive test has been reduced to a lame example of a person’s true driving ability. Please know my own two children on their drive tests were never asked to make a lane change, didn’t show that they could do a U-turn or never even had to do a 3 point turn. My son made only right turns on his 8 minute drive route. My daughter was angry how easy her drive test was. She knew I had trained her to be a 5 Star Driver and was wanting a real drive test. Parents please get serious about your children’s behind the wheel training. Head of software for Google’s Self-Driving Car Project Dimitri Dolgov, says that one thing he had learned from the project was that human drivers needed to be “less idiotic.” 5 Star Driver teaches young drivers to be the smartest drivers on the road. CALIFORNIA, Aug. 20, 2015 A Leader in the Nation’s Driver Education Industry, Creating A 5 Star Driver Beyond Drivers Ed®(www.5stardriver.com) says that the driving school industry is broken. 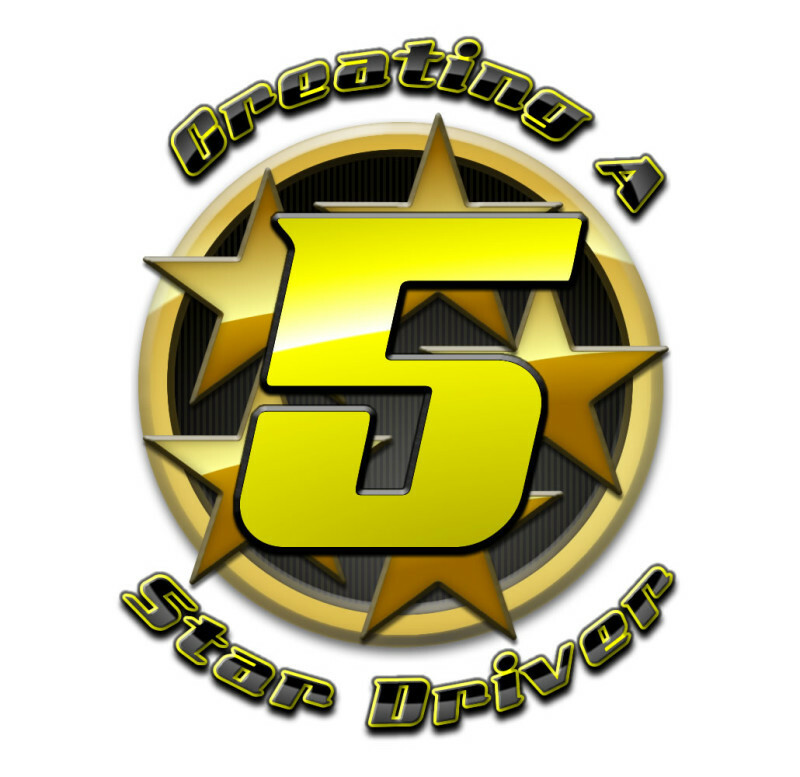 5stardriver.com was developed to give families a way to make young 5 Star Drivers who can survive among low level drivers everywhere. New drivers may be able to pass the requirements of state driving tests however statistics show they lack the critical know how to drive safely. According to a 2008 Top 10 Leading Causes of Death in the United States report by the NHTSA automobile accidents are the leading cause of death for people ages 8-34. The driving schools and proficiency tests at Motor Vehicle Departments have miserably failed at putting trained and safe licensed drivers on our roads. How big is the problem? In 2011, about 2,650 teens in the United States aged 16–19 were killed and almost 292,000 were treated in emergency departments for injuries suffered in motor-vehicle crashes. That means that seven teens ages 16 to 19 died every day from motor vehicle injuries. How can Creating A 5 Star Driver Beyond Drivers Ed® save lives? 5stardriver.com has the answer by putting important driver training methods in the hands of parents and their young drivers. By subscribing to the online video lessons or purchasing the 5 DVD box set @ 5stardriver.com parents and their children can watch and go apply the best and most effective training methods available. These lessons are a new and better way to teach driving by master driving instructor John Cullington and the superior Cullington Driving Concepts®. Parents and their young drivers need better teaching methods then what is “the norm” today because sadly cars are safer than ever but drivers are worse than ever before. That is why self-driving cars are in the news these days. Think about it, as a driver you are encountering an increasingly dangerous and thoughtless driving culture that maims and kills thousands every day. This will only worsen due to the negligent driver training and testing that too many people accept as sufficient. Parents cannot allow the cheap driving schools to be the so called “experts” tasked with teaching their children how to survive among so many less than 5 star drivers out there. The run of the mill low level driving schools, or parents who yell and scream while teaching the young drivers their bad habits are creating inferior drivers who are ill prepared to be true skilled drivers in all types of driving situations. The Department Of Motor Vehicle agencies play a huge part in the ignorant type of drivers being licensed to drive. The current drive test at most DMV’s average a total of ten minutes of driving. In some states like Florida and Arizona subscribers to our YouTube channel have commented that they never left the DMV parking lot and received a driver’s license. This is totally negligible and will continue as currently in California 3,000,000 non US citizens are lining up to get their license and are put through a Mickey Mouse drive test. Many teenagers of today have extra challenges that inhibit the learning curve for being a safe driver. Our current generation has increased tunnel vision and limited multi-tasking abilities due to their sedentary lifestyle which sets them up for trouble. Many kids don’t even grow up riding a bicycle and then when they are put in a car with minimal training they often learn as they go after they get their license. This is a real backwards way to go about being safe. The video driver training program by 5stardriver.com is the first of its kind drivers training filmed on actual driving lessons with five in car digital cameras. Our hope is that people put no faith in our nation’s driver education industry and partner with 5 Star Driver to progress through this complete innovative program and make their children superior 5 Star Drivers. Our automobiles are tested for their crash survivability rating, 5 Star being the safest. We should all strive to make new drivers 5 Star rated as well. The video lessons are available as an online subscription or in hard copy DVD’s. Follow up to my Sept. 2015 blog post: Driving with strangers while ridesharing….